the recording is comprised of unprocessed field and or location recordings in 10 minute parts mixed consecutively person to person. recorded live at issue project room – oa can factory, brooklyn ny. the order of performance: scott smallwood, sawako, seth cluett, ben owen and civyiu kkliu. 2007-08-23. Organized as a transversal field recording orchestra, the combo of Scott Smallwood, Sawako, Seth Cluett, Ben Owen and Civyiu Kkliu structured this project, providing a draft of unprocessed recordings strictly localized in fractions of 10 minutes each that have been consecutively mixed by an artist in a reciprocal handover. In “Phonography Meeting” the background climax is maintained by an “ambiance” very much “in progress” but basically homogeneous, despite the plurality of sound materials included here. The result, besides being interesting and enjoyable in its particular aesthetic interpretation, obviously involves a whole series of reflections on the approach – not always similar – that brings an investigator to operating with such procedures. “Who is the composer?”, wonders Scott Smallwood, implicitly underlining how the randomness implied in any capture stimulates the sound-artist to develop a particular attentive quality. Sawako – instead – in the gentle pseudo-simplicity that is her mark, tells us how she loves to make recordings in the big parks of metropolises such as Tokyo or New York City, while Seth Cluett asks himself how much the act of recording “isn’t a form of memory in itself but a catalyzer for imagination that mirrors memory in its way of operation”. With non textual interventions (in the included booklet) Ben Owen and Civyiu Kkliu guide us to other reflections: on the visual, site-specific nature of the work of a sound artist and on the intrinsic permutational quality of the recorded material, reminding us in a Burroughsian way how cut-up techniques are redundant of poetry but can also assume the form of an exercise in exorcism referring to the emptiness of everyday life. Comme d’habitude sur le label winds measure, la pochette (signée Ben Owen) est magnifique et la musique est littéralement hors du commun. Pour phonography meeting 070823, il s’agit d’une suite de field-recordings, quoique qu’une suite évoque peut-être un peu trop la musique, il faudrait peut-être mieux dire qu’il s’agit d’une fresque en cinq tableaux, ou d’un poème en cinq strophes je ne sais pas. Plus précisément, il s’agit de cinq tableaux sonores composés de field-recordings uniquement, cinq propositions de cinq musiciens qui se succèdent. Dans les notes, on peut lire que la “phonographie” n’est rien d’autre que l’écriture des sons, l’écriture sonore; et effectivement, chaque musicien propose ici, avec son propre langage sonore, un univers à faire vaciller l’imaginaire, un univers construit à partir d’un langage composé de sons divers, et non de notes. Smallwood commence avec des gouttes d’eaux qui tombent mécaniquement dans du liquide, gouttes accompagnées d’une sorte de métronome, tandis que des voitures circulent ponctuellement; et parfois, cet univers sonore est interrompu par une mélodie mécanique elle-aussi. D’un autre côté, Civyiu Kkliu clôture cette fresque avec un drone puissant, brutalement interrompu par des bruits blancs, qui finiront eux-mêmes par fusionner avec le bourdon, dans un finale brutale et intense. Entre-temps, on peut entendre des enregistrements citadins, des fêtes d’anniversaires enfantines, inquiétantes et fantomatiques, des bruissements de feuilles, du vent, des micros ultrasensibles, etc. La force de cette suite poétique vient de la diversité esthétique des matériaux: des matériaux parfois très abstraits que l’on peine à reconnaître, d’autres d’une limpidité envoutante, on est toujours balancé entre la musique (mélodies, rythmes) et le bruit (souffles), entre l’abstrait et le concret, entre le déterminé et l’indéterminé. Cette diversité produit des univers multiples qui demandent une attention et une activité importante de la part de l’auditeur, si jamais il veut s’y retrouver. Les différentes strophes de ce poème (ré-)activent la puissance et les possibilités de l’imagination, de la sensibilité auditive, autant chez les musiciens (lors des enregistrements et lors de la création) que chez les auditeurs. Musique pour le corps et l’esprit, qui peuvent enfin se réunir (alors qu’ils étaient faussement séparés par une idéologie scientiste) dans cette musique poétique, aventureuse, sensible, nouvelle, charmante et envoûtante. As usual on the winds measure label, the album cover (signed Ben Owen) is beautiful and the music is literally extraordinary. In phonography meeting, 070823, it consists of a suite of field-recordings, although as the term suite evokes “music” in a perhaps too much traditional way, it might be better to say that this is a fresco in five tables, or a poem in five stanzas, I do not know. Specifically, there are here five sonic tableaux consisting uniquely of field-recordings, a succession of five offerings from five musicians. In the notes we read that “phonography” is nothing other than the writing of sounds – sonic script. And indeed, each musician here offers through his own individual idiom a sonic universe to wobble imagination, built from a language composed of various sounds rather than musical notes. Smallwood begins with drops of water falling mechanically in a liquid, accompanied by a kind of metronome, while occasionally cars move around. Sometimes this sound universe is interrupted by a melody, which also sounds mechanical. On the other hand, Civyiu Kkliu brings the fresco to a closure with a powerful drone, brutally interrupted by white noise, which eventually merges with the drone towards a brutal and intense final. Meanwhile, we hear recordings of urban environments, children’s birthday parties, disquieting and ghostly, rustling leaves, wind, ultra-sensitive microphones, etc.. The strength of this poetic suite results from the aesthetic diversity of materials: sometimes they are quite abstract and difficult to identify, other times captivatingly crystalline. One is continuously balancing between the music (melodies, rhythm) and noise (breathlike sounds), between the abstract and the concrete, between the determinate and indeterminate. Such variety produces multiple sound worlds which require special attention and a significant activity on the part of the listener, if he ever minds not to get lost in it. The different stanzas of this poem (re-)activate the power and possibilities of imagination and of aural sensitivity – both among musicians (when recording and when creating) and listeners. Music for body and mind, which can finally unite (after having been deceivingly separated by a scientistic ideology) in this poetic, adventurous, sensitive, novel, charming and captivating music. It’s always nice to get in the mailbox Winds Measure releases and one of the reasons is their packaging: visual design is clean, austere and sober, paper is nicely textured, booklets are pressed with relief printing and in general every detail has been carefully and tastefully taken care of. “Phonography meeting 070823″ is the product of a performance at Issue Project Room in Brooklyn, NY on August of 2007 when the artists gathered and used unprocessed field and or location recordings in a 10 minute person to person performance/sequence that sums for a 47:14 final piece. The result is quite heterogenic, it ranges from raw phonographic archive to what seems like more processed material. The order of performance was Scott Smallwood, Sawako, Seth Cluett, Ben Owen and Civyiu Kkliu and you can find a folded paper sheet with text and images by each one of the performers. Scott Smallwood has a very nice text about field recordings where he talks about the frustration of the field recordist when the sound produced by the object of his recording is interrupted by other “unexpected / unwanted / hidden” sounds and how this experience works as a door to a universe of thoughts and images that the recordist encounters while recording. This beautiful text is reflected during the first minutes of the piece where the juxtaposed sounds create this focus / distraction effect as the more environmental and natural sounds seem to clash with the noisy droning sounds of noise pollution as they come to the sufrace and disappear. Scott Smallwood is very effective at creating a sequence with such strong instrumentation and still draw this level of articulation with the text; this writings are something everyone with a reduced hearing experience can relate to, but it goes deeper and further into our experiences with the unexpected, the unpleasant, the misleading and the distracting. After minute 9:40 a sound emerges, it seems like some sort of machine that fades out to and a series of watery sounds and panned voices that arise and develop. Sawako’s artwork part is a handwritten text where she talk about parks. She talk about them being some sort of calm relief in the middle of the noise produced by the big cities. After minute 10 the piece acquires some sort of introverted character, as it feels like we are in the middle of something overwhelmed and dazzled by the presence of sound. Again a very interesting and effective articulation between the sequence and the text. On minute 18 the sounds of what seems like church bells are revealed. Sett Cluett’s is featued on the artwork with some really interesting text about memory and imagination and about how the recordings of sounds and the playback of those sounds triggers the imagination on the listener with the help of the memories imprinted on the recordings. This text leads to very interesting questions and reflections towards the act of recording and the use of the recordings when played back. On Minute 22 a very powerful sequence starts build up with juxtaposed sounds that are not easily recognizable while revealing this fascinating sound object withs a strong rhythmic and narrative character; around 27:40 these sounds fade to another sequence of a sounds with rhythmic patterns produced by what seems like a single object being physically manipulated either by man or nature. Ben Owen’s presence in the artwork sheet is a series of six treated photographs of what seems like landscapes. At minute 32 a series of harsh textured sounds emerge. The sound image of this sequence is beautiful very immersive and tactile; this part has as noisy / artificial-like nature that develops through uneven organic patterns which reveals a beautiful formal analogy. Another very strong perceptual experience for the listener. Civyiu Kkliu is from Japan and on the artwork sheet he played with words in some sort of conceptual exercise. In the last ten minutes of the piece the sound becomes more artificial and abstract. More than phonography this part is reminiscent of electroacoustic sound as it gives to the whole work an unexpected twist that leaves the listener surprised and wandering. Very strong ending. “Phonography meeting 070823″ is a work that rises interesting questions and reflections towards the act of recording and towards the listening experience while revealing beautiful sound images so strong and full of sense that could work equally effective with and without the images and text. Five recordings as presented live at Issue Project Room in 2007, all based around field recordings, bleeding from one to the other. 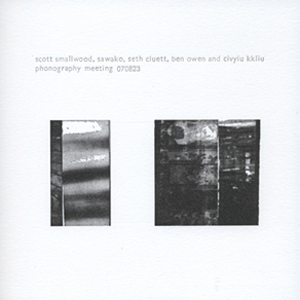 The creators provide “notes” for each, ranging from proper note to six photos (Owen) to a set of three and four letter words (Kkliu). Smallwood’s piece mixes more or less “traditional” sounds–wind, water, chimes, birds–but it has an appealing thickness to it, a density often missed in such works. It’s in episodes, like a series of snapshots, drifting into a fine deep drone that ushers in a welter of urban sounds, a large, populated interior space. Actually, I’m never quite sure when one person’s music ends and another begins. I’m thinking that the children partying are within Sawako’s contribution, but who knows? Doesn’t matter too much…It progresses through wooly buffeting with crunchy…footsteps? (perhaps Cluett’s portion)…abstract crackles, indecipherable sounds (Owen? ), very intense, like hyper-magnified quiet noises…a buzzing hum, very long held, a household device, perhaps, listened to from a fly’s closeness. FIne journey, wish I’d been there. A busy day today, getting a lot done, catching up on the email backlog, cooking and eating a great lunch with Julie, starting to write my review of Grundelweiser for The Wire, and this evening, as well as listening to the music I am about to review, I turned in my top ten records of the year to the magazine. I haven’t felt comfortable with this kind of thing for a few years now, and as we are less than halfway into November and the pile of unlistened to CDs here remains of small skyscraper proportions I feel even less easy about it than ever. If The Wire print the list this year (they didn’t last year) then I will add some further notes here and alter the list to include anything further that may have crossed my path. If the list doesn’t get printed then I’ll do the same as last year and pretend I never wrote it! So, to tonight’s CD. before writing, I should add that returning to CD listening over the past few days after the intense experience of the Grundelweiser festival hasn’t been easy. Everything I have played has seemed loud and dramatic, for obvious reasons, and readjusting my senses to more active music has taken a bit of time. The CD I have listened to the most though, while not particularly quiet does require a similar kind of closely attentive listening. The disc in question is a release on Windsmeasure, a collective release by five (I think) New York based field recordists, that is, as far as I can tell, a collection of five live performance excerpts from a concert in the city that gives its name to the CD’s title- Phonography Meeting 070823. The five musicians (should we call them phonographers?) are Scott Smallwood, Sawako, Seth Cluett, Ben Owen and Civyiu Kkliu. As well as provide the music for the CD, each of them also wrote a few notes on field recording for the liner notes, which range from the thoughtfully humorous (Smallwood) to the pictorial (Owen) to the obliquely impenetrable (Kkliu’s concrete poetry). The entire package, being on the windsmeasure label is of course lovingly designed and printed. Now, according to my CD player, there is only one track on this disc, and while for certain there are many points in the piece whereby the sounds cut from one recording to another, its impossible to tell where one composer’s work starts and another’s ends. The liner notes state that the performances run in the same order as listed on the sleeve, so i could hazard a guess at who has contributed what here, but somehow it doesn’t seem important, and I would prefer to treat the CD as one single work collectively curated. So a lot takes place in here, ranging from some of the clichés of field recording, but done very well, to some very nice, far more abstract work. I am on record a few times this year saying that I am bored of hearing certain sounds presented in familiar, uninteresting ways. This disc opens with the sound of running water, I think a rainstorm, with water gushing from somewhere alongside one constant, rapid and loud drip that gives the sounds an odd sense of metronomic rhythm. Yes, I have heard a lot of CDs of water-related field recordings, but here this is done well, and the recording has enough personality of its own to keep it interesting, just as it doesn’t outstay its welcome either, moving on to other sounds after just a few minutes. We also hear children shouting, another familiar trait, but there they are muffled voices, perhaps at a shopping centre, with other peculiar sounds foregrounded alongside, including something that sounds like the call of an elephant. The reason this CD works for me (and it works very well) is through its constant stream of sounds that make their mark on you, present you with their varying qualities, lead you to wonder what you are listening to, and then merge into something else, something often quite different again. So we have the children, perhaps playing kazoos?! and then a lovely section of soft crunching sounds, gritty and rough in texture and impossible to identify, followed by a series of extended buzzing and humming, maybe domestic appliances recorded, maybe computer feedback, its hard to tell, but these sounds are nowhere near the gushing water that opened the piece and take the music to somewhere quite different. One of my concerns about field recording, and then musical compositions based upon their arrangement, is that it can be a very easy thing to do. Digital recorders are cheap these days, and throwing a few sound files into sequencing software takes a matter of minutes. Occasionally I receive CDs that sound like little time was taken over them, and often it feels like little original thought, or little compositional integrity has been applied to the music. This is not the case with Phonography Meeting. The sounds here are all interesting, all encourage curiosity and closer listening rather than just present themselves inactively and the album oozes a feeling of love and care. To quote Scott Smallwood from his excellent liner notes; “So many recordings have been ruined by inability to still my hand and heart, I get too excited!”. The passion shown here comes through in the music, there is nothing relaxing or ‘ambient’ here, everything grabs your attention and feels like it has something to say. These are the essential differences with field recordings for me. First there is the search for sounds, new sounds, difficult sounds, hidden sounds, unusual sounds- and then they are pulled together in an intelligent and caring manner. Although recorded live at a concert, and so all presented in one evening I thoroughly suspect that the work here was carefully chosen and considered before it was used. When utilised this way field recordings will always win me over, as this album does very nicely.